20 years ago, as a 2nd year undergraduate at Delhi University, I was lucky enough to work on a project for World Wildlife Fund (WWF) in New Delhi, India. I oversaw the screening of some important conservation documentaries to a distinguished group of international dignitaries and officials. 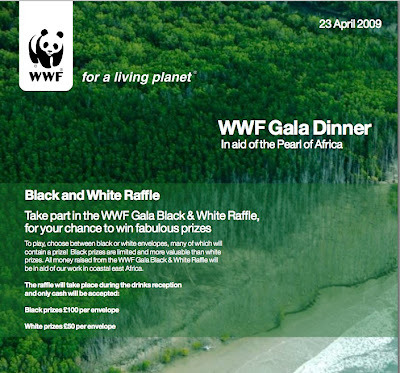 It was a small event but very meaningful for me because I already then believed that we can do something about (at least some changes) we don't want to witness on our planet and the WWF stood out as an important and still unique organisation at that time. It was relatively young, HRH Duke of Edinburgh had recently taken over as the president and it had about a million supporters worldwide. A week ago, I again had the opportunity to get myself involved with the WWF - now seen as a vetran dowager among the plethora of conservation organisations that continue to spring up around us. With 5 million supporters worldwide the WWF is concerned with far more than habitat destruction and animal protection issues from which it initially originated -- and it made me as happy as the first time. WWF does great work and deserves our support whereever and however we can give it. 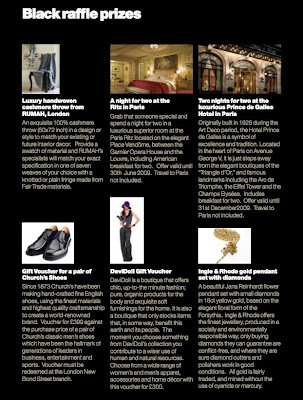 On this occasion DeviDoll provided a luxury voucher for the Black and White Raffle that took place at the WWF Gala Dinner on April 23 to support the WWF's conservation work in Coastal East Africa. Along with international foreign dignitaries, also present were comedian Alistair McGowan, celebrity Chef Tom Aikens, football star/presenter Graham Le Saux and TV presenter Ben Fogle. A total of £200,000 was raised.....in crunch times like this, not a figure to be sniffed at. If you want to do your bit with the WWF just peruse this. I was very happy to meet my old friend again and also, to make the lucky winner of our luxury shopping voucher, a sort of brand ambassador for ourselves in that she is now going to be 'doing good by looking good'. Which is how we like it at DeviDoll.